Project Scope: Managing Dynamics offers various pathways through which to manage business and interpersonal challenges and opportunities within organizations and between individuals. 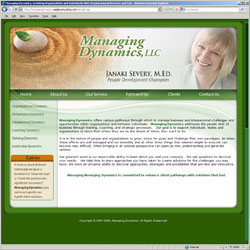 Managing Dynamics addresses the people slide of business through training, coaching, and strategic processes. Our goal is to support individuals, teams and organizations to move from where they are to the dream of where they want to be. It is in the nature of people and organizations to grow, strive for goals and challenge their own paradigms. At times these efforts are well managed and run smoothly and at other times things that seemed simple to execute can become very difficult. Often bringing in an outside perspective can open up new understanding and generate options. Design components: New site design consisting of all graphics including the menu, image design and site layout. We also produced their identity package including business cards. “David Maria of Vortices Design is uniquely able to design and deliver websites that are personal and professional. The biggest challenge in finding a web designer is to find person who listens and goes beyone what the client wants and creates what perfectly represents them.